Scale crappie, then filet and remove rib bones. Leaving skin on helps keep the delicate flesh in one piece. Heat olive oil, saute shallots and garlic, before adding fish flesh-side down. Briefly let the fish cook, approximately 2 minutes, before flipping and finishing fish skin-side down. Salt and pepper. Remove fish. In same pan, start to melt butter, at same time cooking the asparagus. 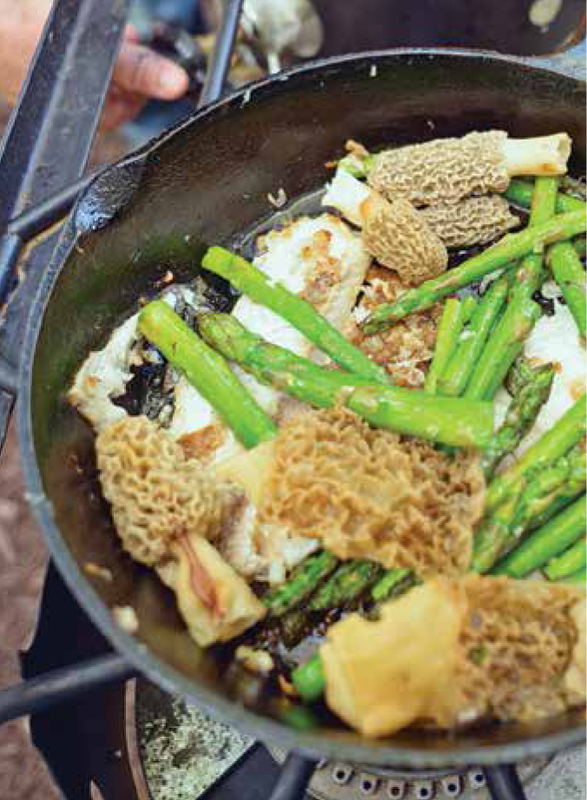 When asparagus starts to shine and pick up a bright green color, turn up heat and throw in morel mushrooms. Saute quickly and deglaze with 2 of the squeezed lemons. Plating Instructions: 3 crappie fillets per plate, topped with asparagus and then mushrooms. Garnish with chives and lemon slice.